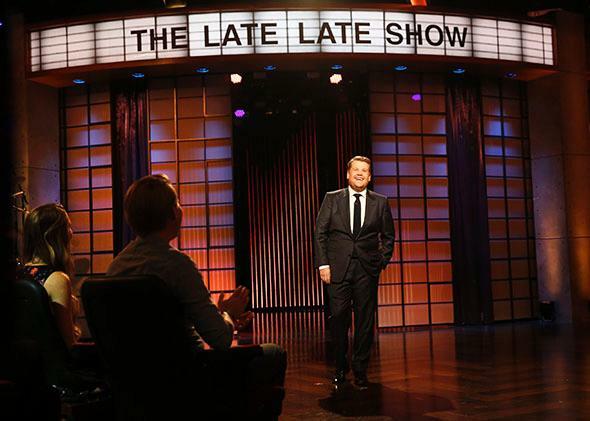 The Late Late Show With James Corden Review: The most earnest show on TV. Is it the most earnest late-night show on TV? James Corden, host of The Late Late Show With James Corden. CBS’s hiring of an actor freshly imported from England to be the next host of The Late Late Show was a sure sign that they wanted to shake up the time slot. And when James Corden made his debut last night, the tweaks were easy to spot: Guests Mila Kunis and Tom Hanks entered the studio one after the other, emerging through what looked like a purple plastic shower curtain to find high-five-offering audience members lining their route to the stage. Twenty-five or so hand slaps later, they arrived at the couch, located to the left of the desk, rather than on the right, as custom dictates. Then came the big shocker: Corden abandoned the safety of the desk and wheeled his chair over to the side of the sofa, close enough to touch Kunis’ arm whenever he felt the need. Rearranging the furniture was the least of it, though. What was truly revolutionary about Corden’s first night on the job was his heartfelt sincerity. A joke about the audience seeing him for the first time and thinking, “Oh, look, Andy Richter got his own show,” was the only gag in the opening monologue. He promised to do his best “not to let anyone down,” and told his predecessor Craig Ferguson it was “an honor” to follow in his footsteps. He offered the audience a potted biography—facts about his wife and kids rather than his filmography—and introduced his parents, tearing up for a moment as he thanked them for their support. Since Corden’s background is in acting rather than stand-up, it’s no surprise that the show relied heavily on pre-taped sketches: First came an overlong, cameo-heavy bit about Corden’s unlikely path to the late-night lineup, in which he landed the hosting gig by snagging Chelsea Handler’s golden ticket and then received training in the late-night arts from Jay Leno, Allison Janney, Arnold Schwarzenegger, Shia LaBeouf, and Meryl Streep. The skit concluded with an image from Conan O’Brien’s nightmares: Leno declaring, “In three months, the show will be mine.” In a later sketch, Corden and Hanks raced through scenes from 29 of Hanks’ movie hits in a matter of minutes with the help of a green screen, a few props, and apparently boundless energy. If last night is any guide, Corden’s blokey demeanor disarms American celebrities. Although he was warm and chummy with Kunis—asking about her new baby rather than her latest movie—when she refused to tell him if she and Ashton Kutcher had gotten married, hedging with “Maybe,” he pushed her to give a proper answer, repeating his question three times until she showed him her ring. He seemed unaware that he had broken the cozy code of the couch, which suggests that his interview segments, while unpolished, could be unusually informative. In the early part of his acting career, 36-year-old Corden was often cast as the leading man’s funny friend. It’s foolish to confuse an actor with the characters he plays, but since Corden was one-half of the creative team behind the hit British sitcom Gavin & Stacey, in which he gave himself the role of Smithy, a sidekick who’s often overlooked and dismissed but in the end shows himself to be a loving, committed, and responsible guy, it doesn’t seem far-fetched to think Corden relates to that role. With his BAFTAs, his Tony Award, and his fancy new job, Corden is anything but a loser, but he has clearly learned the benefits of being underestimated. When giving interviews about his new job he constantly talked himself down, virtually suggesting that he was unqualified for it and surely doomed to fail. The self-deprecation continued in last night’s debut: In the long opening sketch, he told Meryl Streep his hosting skills were “awful,” to which she replied, “Yes, yes, you are terrible at this. Perhaps the worst I have ever seen.” If we were watching one of Corden’s movies, this is where his character would start to show his mettle. Corden bears an odd resemblance to a golden retriever—friendly, approachable, and desperately eager to please. At the end of last night’s show, he appeared at a grand piano and crooned a song dedicated to his audience. “From tonight, I undertake to do all that’s in my power to entertain those still awake at this ungodly hour,” he sang. “From the worker home from second shift who’s still got his suit on, to the stoner who can barely lift her face from off the futon.” He’ll be back every night until he wins America over.